Traditionally speaking, Thanksgiving is a time to celebrate a bountiful harvest. It’s in this spirit that we post today’s image. But first, a back-story. The valleys of the Alps have been inhabited for thousands of years. In the beginning, Neolithic people settled in caves like those at Wildkirchli in the Appenzell region of eastern Switzerland. Over time, as the glaciers receded and the climate warmed, the cave dwellers emerged from the rock. Low lying villages took hold. As the years went by, the villages grew, populations expanded, and the surrounding resources dwindled. Eventually, the needs of the population surpassed the carrying capacity of the land, and the inhabitants turned their eyes skyward. They needed more space. The villagers cut meadows into the slopeside forests, digging, chopping, and rolling boulders as they climbed. The mountainside became an extension of the low-lying farms, and the new pastures, literally hand-hewn from the mountain slopes, gave farmers new acreage to graze their livestock. Thus, a new tradition was born. Cattle migrated to the high pastures for summer grazing, while grass grew and villagers stored it away for winter down low. Mountain people still maintain traditions from long ago. At first glance, this scene may not evoke the stereotypical image of a bountiful harvest replete with turkey, pumpkins and all that jazz, but to an alpine farmer, this picture celebrates bounty just the same. A simple pile of grass promises one more winter that is free from want. It promises another glass of milk, a wheel of cheese, and an extra pat of butter. It’s meat on the table and winter heat from sleeping livestock. (One of the main reasons that mountain homes were built above barns). In the mountains, a barn full of hay means security. It means a day’s work accomplished and the promise of a good night’s sleep. Like the proverbial woodpile, banked against the oncoming storm, this is money in the bank. This is self-sufficiency at it’s best. This is bounty. When I look at this photo, I see a story that transcends time. I see a tale of the hills. Ultimately, I see thanksgiving, and I’m thankful that I get to witness this traditional style of living first hand. Image: By Ken Fuhrer. 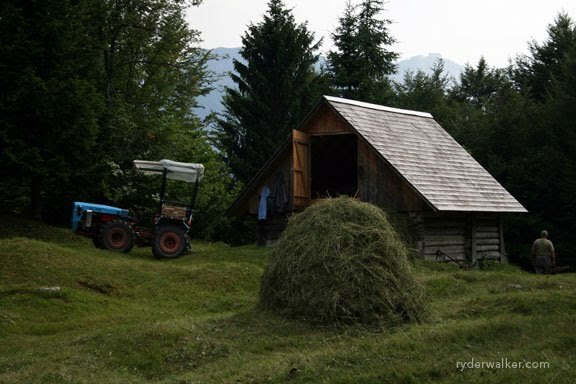 From the alpine pastures of Slovenia’s Julian Alps.